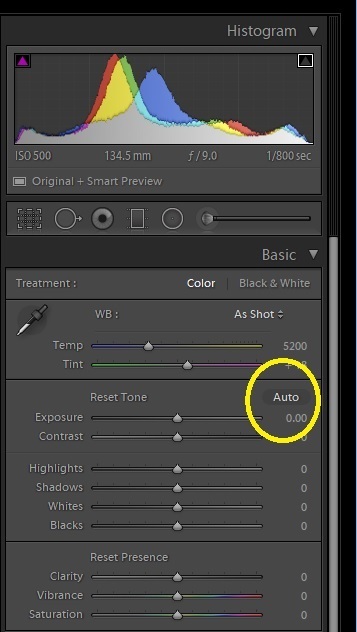 The Auto button in Lightroom Develop module is now actually useful (as of Lightroom CC Classic 7.1 in 20 December 2017). When you click the [Auto] button, Lightroom now applies artificial intelligence based on the practices of many photographers to make individual adjustments to each image. This can provide a very useful basis for further adjustments. It entirely comprises changes in the basic panel and does not include white balance, clarity, tone curve, sharpening and lens correction amongst others. 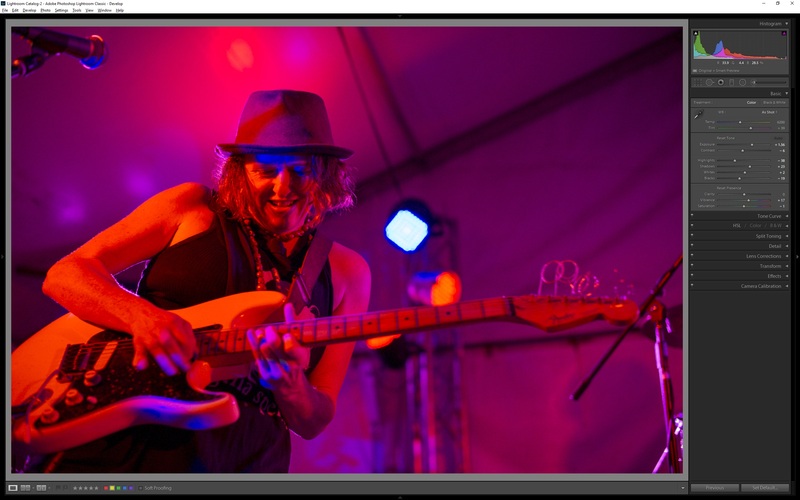 For example, here is a live music image. Lights are flashing on and off and one is coming straight at the camera. This is a difficult exposure situation because the appropriate level of exposure compensation can change moment by moment. Here the image is significantly underexposed. So we hit the [Auto] button. Kaboom! What a difference! You can see over on the right, it’s not just that the exposure increases by over one and a half stops, most of the sliders in the Basic panel have changed too. (Click for larger image if necessary). How those sliders change will differ for each image. Of course, the [Auto] button won’t always be right, you will usually need to modify some settings and you can always reverse it and start again. And we’re finished with this image. Wwe still need to apply lens corrections, sharpen, straighten, reduce the brightness of the “white” (actually blue) light, crop, maybe adjust some colours and in Photoshop, remove the microphone at top left and the mike stand at lower right. Where the [Auto] button has got us to is impressive though. You don’t have to click [Auto] for each image, you can do it for a whole batch of images. Select images in Grid mode in the Library module. If you don’t do that, any changes you subsequently make to an image in Develop will be applied to all selected images. 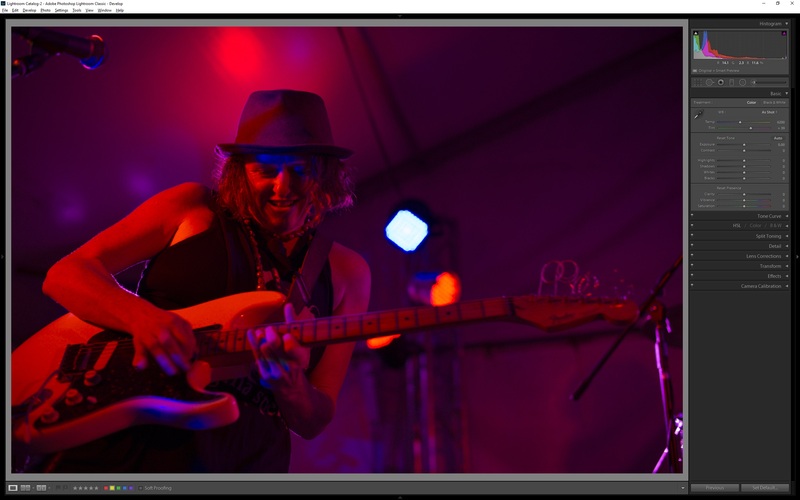 If you start with an unedited image you can make such changes and then save them to a Preset. For capture sharpening, in the left column in the Develop module under Presets, select Sharpen – Faces or Sharpen – Scenic. Note that this will not work for Fujifilm cameras with the X-Trans sensor. See instead this article and create your own presets. 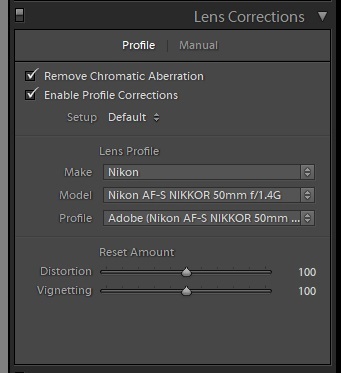 Almost always, you will want to check [Remove Chromatic Aberration] and [Enable Lens Corrections] in the Lens Corrections panel at the right in Develop. (Probably the only exception is if you’re playing around with a fisheye lens and don’t want to use the lens profile). 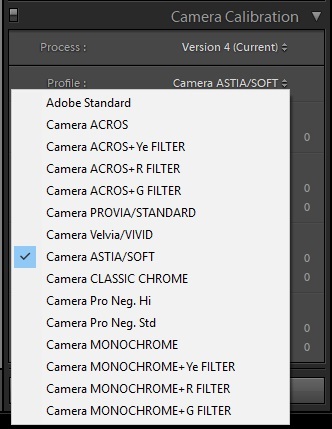 Fuji cameras have a great selection of camera profiles in the Camera Calibration panel at the right in Develop. You might want to select one as a default. You can always change it later, for individual images or en masse. For Nikon, Canon and other brands, this may not be so useful. Have a look, see what’s there and try the alternatives though. It’s manufacturer specific and camera specific. OK, you’ve got some default changes in an otherwise unedited image. To save them as a preset, click the “+” sign at top right of the Presets panel (three images above). 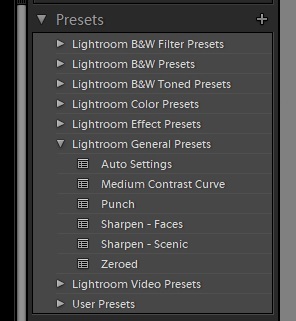 Then, you can apply them to individual images or groups of images from the Presets Panel (under /User Presets). 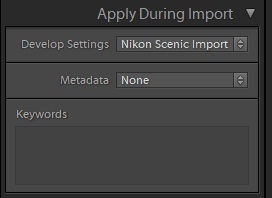 To apply as an import preset, select your saved preset under Develop Settings in the Apply During Import panel at top right of the Import screen (The one of mine illustrated is called Nikon Scenic Import). When you import images into Lightroom, you can select to build previews, which can be either Embedded and Sidecar Previews, Standard Previews or 1:1 Previews. If you later click the Auto button for an image, or especially for all images you import, the image may change greatly as you see it in the Develop module but it will look as imported in the Library module because the previews have not changed. So what you will need to do is regenerate the previews with the command Library/ Previews/ Build Standard-sized Previews or Library/ Previews/ Build 1:1 Previews. Therefore, if you are going to run the Auto Button on all images yo import, there is no point building previews when you import. You should run the presets on import, select all images (as shown above) and run the Auto Button, then build standard previews or 1:1 previews. This entry was posted in Uncategorized and tagged Canberra Photographic Society, Computers, Lightroom, Photography, Post-Processing.